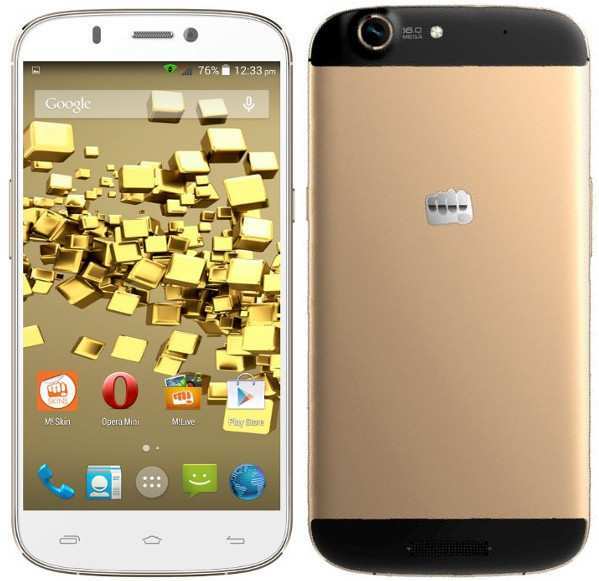 Micromax Canvas Gold A300 is official now and is available online. The new Canvas Gold A-300 comes with a 5.5 inch display having full HD 1080p resolution. It has 2GHz octa-core processor and Android 4.4 Kit-Kat operating system. It would compete with Gionee Elife E7, Micromax Canvas Knight A350, HTC desire 816, Samsung Galaxy Grand 2 and Intex Aqua Octa. It has 16MP AF rear camera with LED flash and 5MP front camera. There is 2300mAh battery under the hood. It is accomplished with 2GB of RAM and 32GB of internal storage out of which 25GB is available to use and 1.5GB is assigned for APPS. The Canvas Gold A300 is supports Dual SIM and can record FHD 1080p Videos. It has G-sensor /m-sensor, gyroscope, proximity and light sensor. The Micromax Canvas Gold A300 comes in White with Gold color and is priced at RS 23999. Buy it online from Flipkart or SNAPDEAL ( Lowest Price ).